With artificial grass installations, doing a good job will make the lawn look great right away, but that’s not all. Each choice you make about how you install your turf can impact how the lawn will look five, ten or even 20 years from now.Start things right with a layer of protective gopher wire under your lawn replacement. It’s not a hard DIY job, and a wire barrier can stop tunnels by gophers, moles, and voles before they lead to bumps and lumps in your lawn. Watersavers has gopher wire and all the turf tools you need for artificial grass installations that look great and stay pest-free for the whole life of your real grass substitute. Check out these tips for how to do it right, and enjoy smooth faux grass for years to come! Once you’ve got your gopher netting, you will need a few tools and hardware items to install it. Don’t worry; they are easy to find. You need to have a pair wire cutters on hand so that you can trim the mesh to the right size for the faux lawn bed. To hold the net in place, you will need to place U-shaped galvanized wire landscape staples every 2 to 3 feet at the edge of each roll of netting. You will also use these to hold the gopher netting in place all around the full outer edge of the mesh area. It’s smart to buy a few more staples than you think you need. They are not very expensive, and it is better to use too many than to use too few. You’re almost ready to start your synthetic turf pest control project, but don’t forget your protective gloves! You are going to be working with sharp wire edges, so gear up to save your hands from any scratch or scrape. Clear and level the area where your faux grass will go. Roll the gopher mesh out smoothly on top of the dirt. As you go, secure the outer edge every few feet with your landscape staples. 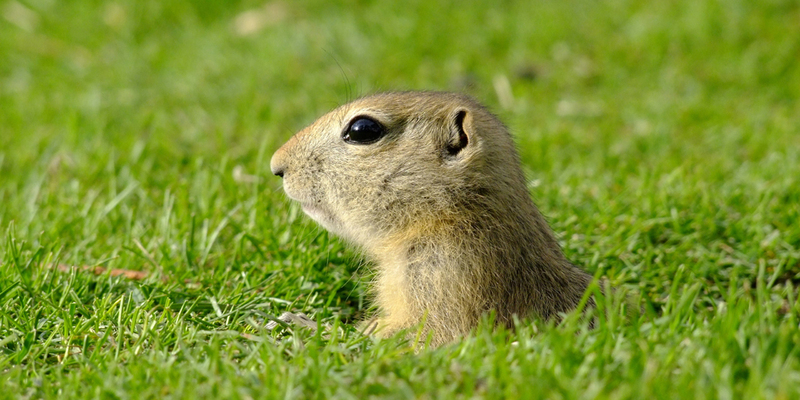 You want your gopher-proof lawn DIY work to stay in place for years, and these will stop it from shifting over time. When you’ve unrolled the gopher mesh all the way from the top of your yard area to the bottom, trim it to size with your wire cutters. If that roll hasn’t covered your full faux lawn area, lay down another line of mesh next to it. Don’t leave a gap between these rolls. In fact, layers of the net should overlap by six inches, so that pests can’t dig up through any gaps. Secure the overlap areas every few feet with staples that you push as deep into the dirt below as you can. Your gopher proof lawn DIY is that simple! Add a layer of protective weed barrier fabric on top, and then place your faux grass. Your yard will stay smooth and safe from pests and lumps. With the right tools and some simple DIY skills, it is not hard to keep your faux lawn free of pests like moles, voles, and gophers. There are lots of yard animals that would love nothing more than to dig up to or right through your faux grass, but you can nip those pests in the bud when you install your faux lawn with the right wire mesh. Some people will tell you that it’s fine to use chicken wire. That’s not true. The holes in chicken wire are so large that a small mole or a pocket gopher can dig right through. You need a mesh that has 3/4 “ or smaller holes. Even if a generic wire mesh is the right size, it can be prone to rust over time. Some kinds of wire may be weak enough that an animal can chew through them, so don’t make a substitute in your mesh material. Be sure that you buy a netting product that is designed and sold to stop small yard pests. Contact Watersavers Turf for any of your gopher wire and landscape material needs. We have a full range of top quality turf accessories, and 60+ styles of faux grass. Get a free estimate for your lawn replacement, or give us a call at 844-974-8873.